December And at Cristesmasse I drynke redde wyne.1)Oxford’s Bodleian Library (MS. Digby 88. It’s a little unusual for Christmas to be highlighted. The calendar pages in Books of Hours for December most often feature an image of hog butchering, a boar roast, or a boar hunt (sometimes they feature an image of St. John boiling in oil, or the baking of bread) as December labors of the month. 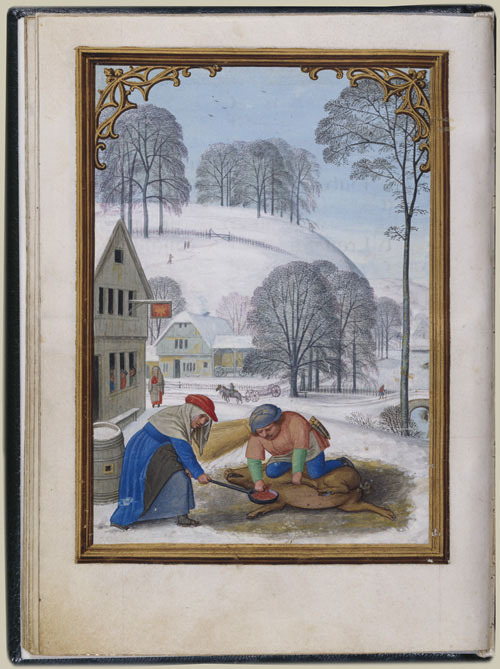 The wintery scene on the right of hog-butchering is the work of Simon Bening, from the Da Costa Hours (Belgium, Bruges, c. 1515) now in The Morgan Library. (MS M.399, f. 13v). The landscape is snowy and people are dressed warmly. They appear to be bleeding out a hog, a necessary step in butchering. The hog was likely “finished” in November by feeding acorns and other nuts. Often a boar is shown standing while a man with a mallet, poised in mid-stroke, gives the pig the killing blow. The boar was an important food source, (particularly for the wealthy). The sow, bearer of new pigs, was less likely to be butchered. While the boar’s head was regarded as a trophy, nothing was wasted, and all was used. Wild boars were hunted by organized teams led by an aristocrat, as in this December image from the Très Riches Heures. There’s a famous depiction of a boar hunt in Sir Gawain and the Green Knight , and a ceremonial feast after, featuring the boar, and of course there’s the still popular medieval Christmas “The Boar’s Head Carol” about the Christmas tide feast featuring the boar’s head as the ceremonial center piece carried into the hall in a triumphant procession. 1. ↑ Oxford’s Bodleian Library (MS. Digby 88.